If you only followed the semiconductor equipment bookings book-to-bill ratio, news in the electronics sector would be depressing. However, IPC — Association Connecting Electronics Industries announced less-than-dismal results from its North American Printed Circuit Board Statistical Program. Last week, the Semiconductor Electronics Association of Japan (SEAJ) reported a book-to-bill ratio for January of 0.55, a new low in a steadily decreasing semiconductor market as compared to 0.70 in December. The ratio is down 80.1% year over year. Then the North American semiconductor equipment book-to-bill announced a new low in January, dropping to a ratio of 0.48, down from December’s ratio of 0.81, and down year-over-year 54%. “Bookings are at the lowest levels since 1991,” said Stanley T. Myers, president and CEO of SEMI. In the IPC book-to-bill results, rigid PCB shipments are down 14% and bookings are down 24.5% in December 2008 from December 2007. The book-to-bill ratio fell to 0.89. Flexible circuit shipments in December 2008 were down 17.1%, but bookings are up 23.8% compared to December 2007. The North American flexible circuit book-to-bill ratio in December jumped to 1.08. The combined ratio for rigid and flex in December dipped, but only to 0.90. “Rigid PCB orders have trailed shipments for nine straight months now, and that is reflected in a declining book-to-bill rate,” said IPC President Denny McGuirk. “Strong orders have been keeping the flexible circuit segment growing, but the whole industry’s December sales were weaker than in prior years. However, the industry ended the year about 1% ahead of 2007,” he concluded. Business news is primarily negative, but not in every company. Hewlett-Packard, world’s largest PC maker, reported that sales missed experts' estimates. Sales in the year ending in October will fall 2–5% from $118.4 B in 2008. Mark Hurd, CEO at HP, is eliminating jobs and closing offices, working under the assumption that the economy won’t improve the rest of this year. Hurd’s pay will be reduced 20% as well, and other salaries will be reduced 2.5 to 15%. On the flip side, at medium-sized EMS providers, business varies. IEC Electronics, a full-service Newark, N.Y.-based EMS provider offering a range of design, prototype, and volume PCB assembly services, announced its Q1 2009 financial results with positive results. Sales increased 25% in 2008. Operating income increased by more than 140%. Net income before tax increased more than 220%. Customers were added in target markets. And the company intends to invest $3.5 million over the next three years in manufacturing equipment to improve productivity, cut rework, and support quality. In a webcast of the annual shareholders meeting, IEC Electronics revealed their positive numbers, but acknowledged that the world economy is in a deep recession. Part of IEC’s strength is in that the company attracts a diverse group of industries, and the military and medical sectors are holding strong. There are hopeful signs in all areas that things will improve. PCs may be down; however, sales of mini/ultraportable devices and Midis, iPhones, and other consumer electronics show promise. The only question regarding the turnaround is: When? Patience is a virtue. Technology has a tempestuous relationship with the past. Many people in the electronics assembly industry have been with the technology from the beginning and can wax poetic about the good old days 10, 20, 30 years ago. It’s not that this past, the glory days, is irrelevant, it’s that their memory cannot overshadow the present. To paraphrase a recent visitor to SMT’s offices, outdated business models can be as “old” as 90 days in the past. Electronics were always advanced by manufacturing technology achievements, and under the shadow of global economic uncertainty, today’s innovations — not yesterday’s business models and volumes — deserve recognition. The 17th annual SMT VISION Awards aim to do just that, looking forward to what the industry can be tomorrow. Much like Girl Scout Cookies, the awards are given out only once a year, but much anticipated and valued throughout. The SMT VISION awards will be presented in more than 15 categories, ranging from underfills to contract services to test equipment, recognizing the best products to lead the SMT and microelectronics assembly industry into new-generation capabilities, business models, and end products. See the companies honored at the VISION Awards ceremony, March 30, 2009 at APEX Expo, Las Vegas. The party will be held in the Banyan Room D, Level 3 of the South Convention Center at the Mandalay Bay, from 6:30 to 8:00 pm, and all are welcome. Products are qualified to receive VISION Awards by persnickety judges, thoroughly evaluating environmental impact, cost, innovation, and other important factors. Look for VISION awards on display with materials, equipment, software, and other offerings on the show floor at APEX. The award signifies a product’s relevance to the electronics assembly and manufacturing industry today and in the future. IPC reports that APEX attendee registration is higher than expected, in the midst of the economic troubles. It seems that  at a time when “value” is being redefined for houses, banks, assets of all kinds  the educational and influential value of programs at APEX remains high, unshaken. If you’re attending the show, be sure to soak up as much useful information as possible for the here-and-now of our industry, and apply it to your business model, job, or research. To see the highlights of the technical conference, including SMT’s free forum on EMS trends, read IPC APEX Expo Preview: Technical Courses and Tutorials and Get Ready for APEX: Preview of Technical Sessions and Noteworthy Events. To see the winning products from the 16th annual SMT VISION Awards, see the VISION Award Winners. Solar energy provides a challenge for almost every aspect of electronics. In basic research, small companies license technology from university-based research to add to the efficiency of solar cells and other areas of photovoltaics production. Some companies provide turnkey manufacturing, marketing, and development for customers entering the solar industry. I toured one such company, GT Solar, to see how they’ve helped improve solar electronics. Small companies, such as San Jose-based startup Solexant, have licensed materials technology from university-based research to add to the efficiency of solar cells. Solexant licensed materials technology from an advancement under development at a photonics institute at the University of Buffalo that can harvest energy from infrared (IR) light to boost the energy of solar cells. Under the executive director Paras Prasad, the team from the University of Buffalo plans to harvest energy from infrared and ultraviolet (UV) ranges of the spectrum yet untapped by today’s solar cells. Various projects use tunable quantum dots to absorb IR photons and organize them by coupling like charges to carbon nanotube (CNT) walls. Other projects convert 980-nm IR to visible light to be absorbed by a solar cell. “We recently showed a capability of harvesting 30% of the IR photons going to a photovoltaic cell,” Prasad said. Since raising efficiencies of solar cells is a major issue in reaching “grid parity,” or costs comprable to those of existing power solutions, the various approaches that the joint venture takes attack the problem from many angles. For newcomers wishing to get into the solar panel production business, companies like GT Solar in Merrimack, NH, offer everything for a practical turnkey solution. GT is able to equip users with the technical, manufacturing, and marketing experience needed to start up and operate a photovoltaic business. “We have experts creating solutions for all three components of the solar value chain: wafer, cell, and module fabrication lines,” said Keith Matthei, VP, equipment sales (Figure 1). Figure 1. Keith Mathei, GT Solar, offers equipment for production of photovoltaic equipment piecemeal or in a turnkey method. At the heart of GT’s equipment is the directional solidification system (DSS) furnace that produces a large segment of the world’s multicrystalline silicon ingots (Figure 2). The DSS furnace grows multicrystalline ingots quickly, cooling from the bottom up. GT has expertise in mechanical design, vacuum and high-pressure chambers, control system design, and crystal growth modeling. By collaborating with University Center of Excellence for Photovoltaic Research and Education at Georgia Tech, University of New Hampshire, and other private and research facilities, GT has been able to improve their products. Figure 2. GT Solar’s Directional Solidification System (DSS) furnace produces a large segment of the world’s multicrystalline silicon ingots. Even in tough times, companies recognize the value of renewable energy. On February 5, Timex Group USA Inc. held a dedication ceremony for its recently completed installation of 800 solar panels outside its Middlebury, CT, headquarters as one of the largest ground-mounted solar electric units in the northeastern U.S. As part of the $2.5 million project, 27 rows of 244-kW solar panels were installed on the eastern side of the watchmaker’s property. The photovoltaic system is said to generated 285,439 kilowatt hours per year, avoiding release of more than 6.6 million pounds of carbon dioxide, 28,000 pounds of sulfur dioxide and 11,000 pounds of nitrogen oxide over the 25-year lifespan of the system. This clean energy project was financed in part through a $920,000 grant from the Connecticut Clean Energy Fund and tax credits. Though renewable energy is just now ramping up and getting established in the U.S., the signs of growth can be seen in all areas, from R&D collaboration to practical turnkey assistance, innovative equipment, and current installations. PCB design doesn’t occur on the SMT assembly line, but good design is the foundation of every process step, from proper screen printing to optimized pick-and-place. With a good design, not only is the board easy to test, it also passes those tests. This week, Mentor Graphics released HyperLynx PI, a design software program aimed at improving power integrity on the PCB. Power has become a major issue, due to environmental concerns with power sapping, due to device heat and operating time challenges with the rise of mobile devices, due to miniaturization, densification, the list goes on. Noise, voltage drop along traces, current density variation, and other problems occur. John Isaac, Systems Design Division, Mentor Graphics, gives the example of 5-V components. In the past, all ICs on a given PCB ran at 5 V. Today, with densification, higher performance, and miniaturization, a board with all 5-V ICs would be disastrous. Some use 1.2 V, even 0.9 V, and multiple ICs on a board will have multiple power requirements. With all 5-V components, 0.3 V of noise is no issue. Change to 1.2 V, and suddenly 0.3-V noise is disrupting operation. If each power net had its own layer in the circuit board, the result would be a Stone Age design, thick and cumbersome. To keep our devices power-sipping, remote, handheld, economical, etc., PCB designers need to optimize power nets. When a board has several voltage requirements and a limited layer stack, power nets will be “jigsawed” together on shared planes. “PCB designers can be slammed with more than 30 power distribution networks, requiring split power planes, networks arranged like jigsaw puzzle pieces, and still the requirement to keep nets around their respective ICs and connected to the power inputs,” Isaac explained. The HyperLynx PI tool was created for designers to evaluate and mesh these power requirements, reducing the need for decoupling capacitators, shortening design times and eliminating respins, and improving signal integrity. HyperLynx PI post-route DC drop: a view of the voltage plane highlighted in the board viewer, along with the results (color map) of the DC voltage drop along that plane. Two common problems can be discovered and resolved with power integrity analysis: DC voltage drop and current density issues. The HyperLynx PI tool illustrates power distribution networks in such a way that either of these design setbacks is easily found and dealt with. For DC voltage drop, ICs placed a certain distance from the power source are not getting their required voltage. Voltage planes are irregular and full of holes, Isaac notes, and a 1.3 V power source on the bottom left side of the PCB, for example, might go through a 1.2 V power distribution network and lose enough current to fall below the tolerances (typically ±10% for the 1.2-V IC on the right side of the board. The under-voltage condition can cause a variety of IC errors from bit errors to complete failure. Designers can use HyperLynx PI’s color-key map of the board to determine where too little power is getting through, and adjust the bill of materials (BOM), PCB layout, or other elements to improve the design. HyperLynx 3D current density plot: a 3D plot of the current density on a plane. Areas of high current density can lead to board damage, disconnected power, and possibly fires. With current density problems, bottlenecks and hot spots are created by concentrating the flow of power too much in one area of the board. When ICs switch or perform various functions, they create a huge current draw, exposing these density problems. Noise and resonance are created by the current, disrupting optimal operation. Designers might solve this through AC analysis, which leads to layout changes, dropping a via into another layer of the circuit board, or adding decoupling capacitors. In HyperLynx PI, designers can again use a color-key map to identify problem areas then try out different solutions, or combinations of solutions. These can be brainstorming sessions, worked out before physical design even begins. Just as good design can be the foundation of good assembly and test, good PCB planning is the foundation of smart, optimized physical board layouts. 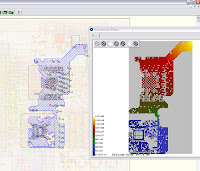 Mentor Graphics made the HyperLynx PI tool to cooperate with its signal integrity analysis software suite, HyperLynx SI, recognizing the heightened importance of power in the modern PCB. “Signal and power integrity should be part of the design from the beginning,” Isaac said. The goal of PCB designers should be minimizing layer count, keeping a lid on costs, speeding time-to-market through reduced design time and prototyping, and giving a board the highest possible reliability from the start by managing tolerances and limits. HyperLynx PI was designed to meet all of these goals, and also to be used by typical layout designers and electronic engineers, rather than just power integrity specialists. For more about the tool, see our coverage of the product release, read Mentor Graphics Debuts Power Integrity Analysis.